I routineously use cryosparc for particle picking, 2D class and initial 3D refinement from F3EC images, convert the data to star (thx Daniel) and re-extract them with relion. Now I had some K2 datasets in hand which all failed for some reason: the coordinates of the picked particles are off. Did anybody else observe this behavior? I see no reason, unless the odd image dimensions of K2 micrographs cause something weird. This is strange - cryosparc stores pick locations as a fraction of the micrograph size (in each dimension). 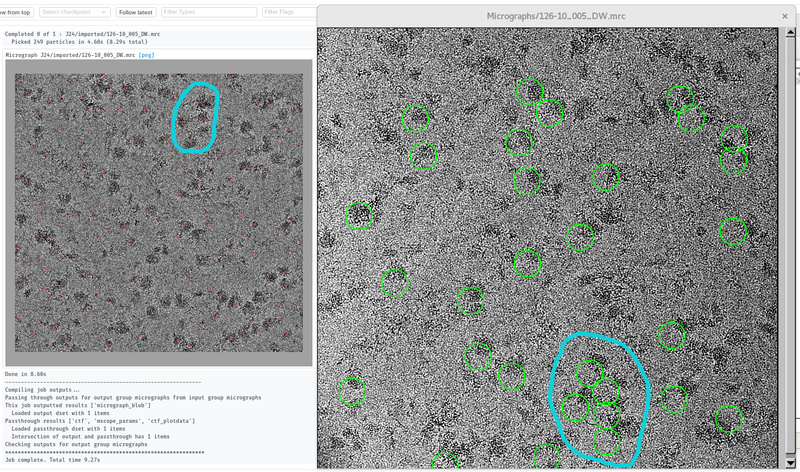 Perhaps @DanielAsarnow can comment on how micrograph .cs files are converted? The only thing that can go wrong is if location/micrograph_shape is wrong or the order isn’t consistent. (Note the ::-1 as it’s z, y, x). In that case I guess micrograph_shape is causing my problem as I doubt the order would suddenly become a problem for K2 data exclusively. What is meant exactly by that? My data is K2 super-res (7676 x 7420). just realized that the dimensions are exchanged in the import micrographs tab compared to spider/eman2. Is a bit off-center when imported. What’s the center pixel in cryosparc? Is it not arr[box/2, box/2]? the order of the coordinates is wrong, which becomes relevant when micrograph dimensions are not symmetric. this will lead to the centered particles. @tarek it doesn’t affect reconstructions, or imported coordinates. You say switching X and Y “fixes” the coordinates, but I’ve gone over this before and found that the coordinates aren’t right regardless of the convention, when they are actually displayed in relion_display_gui. I left it the way it is because it was closer than the other way during these tests. (I also tried a few possible alternate conventions). I also think the convention in cryoSPARC may have changed at some point, and might not agree between movies (3D) and micrographs (2D). There’s also another field, micrograph_blob/shape, but right now I’m just looking at the location one. are the particles really in the right place and centered? If @apunjani gives us the conventions, or we’re very sure we have it figured out, I can update csparc2star.py one last time. The official export feature should be released soon, so if it’s not a trivial edit I may decide to skip it. yes, after conversion they are prefectly centered. I am only speaking about imported micrographs. Never tried movies, since I pre-align them with MC2. Here is a small “fix” if someone wants to try it in the shell for a super-res K2 micrograph.